It's clear Microsoft is feeling the heat from tablets and the Chromebook. 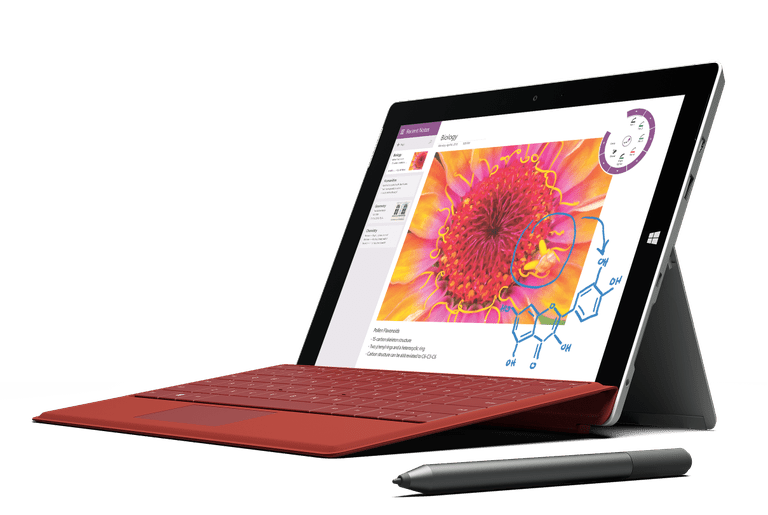 With a similar price and running a full-blown version of Windows 8.1, Microsoft's Surface 3 is aimed directly at the iPad Air 2. However, does Microsoft's newest tablet stack up to an iPad? Should it even be setting its sights on Apple's tablet? It's almost hard to believe that Microsoft once had a reasonably good grasp on the smartphone market. Windows Mobile may have played second fiddle to Blackberry, but in the days before the iPhone, Microsoft looked primed to play a major role in mobile. After several failed attempts at a mobile operating system, Microsoft seems ready to throw in the towel on its latest gambit—Windows RT, which was never a good idea. As a Windows platform that didn't run Windows applications, RT was dead from the start. Fortunately for Microsoft, mobile technology is at a point where a smartphone or tablet can run the full version of Windows. That's the Surface 3's best trick—running Windows software. The Intel Atom X7 processor inside the Surface 3 may be powerful enough for Microsoft to put Windows 8.1 on the device, but in terms of raw power, the processor doesn't stack up against the iPad Air 2. The A8X system-on-a-chip that powers the iPad Air 2 is one of the most powerful mobile processors out there, and it tends to beat out the Intel Atom X7 in benchmarks. Windows 8.1 only compounds this issue. A chunky operating system with a big footprint, Windows eats through a big part of that processing power, leaving fewer CPU cycles for applications. An even bigger issue for the entry-level Surface 3 is the 2GB of RAM. While this matches the amount of memory on the iPad Air 2, it's not enough for a smooth Windows experience. Windows 8.1 may work on 2GB of RAM, but it is hard to say it runs on it—rather, it walks on it. For those interested in the Surface 3, upgrading to 4GB of RAM and 128GB of storage space is well worth it. The entry-level machine is going to run out of steam doing anything more than web browsing and light word processing. The 10.8-inch screen on the Surface 3 makes it slightly bigger than an iPad Air 2, but the 1920x1080 graphics don't compare to the iPad's 2048x1536 Retina display. A larger display with a lower resolution means the Surface 3 doesn't look nearly as sharp as the iPad Air 2. Add in the slower processor and games intended for much faster hardware, and the Surface 3 is far from a game machine. It'll be able to play Candy Crush with the best of them, but while gaming is one of the big perks of the iPad Air 2, it'll be one of the disappointments of the Surface 3. Microsoft's big bet on the Surface 3 is the $499 price tag, which seemingly matches the entry-level iPad Air 2. However, that price doesn't include the Microsoft's $130 Type Cover, which adds a keyboard and trackpad to the tablet. The Type Cover is a necessity if you want to get everything out of the Surface tablet, so realistically, the Surface 3 costs around $630 for the low-end model. If you don't want to poke along at a snail's pace, you'll need to spend $730 for the 4GB Surface 3 and the Type Cover. It is difficult to define a good market for the Surface 3. The tablet with the Type Cover is more expensive than an iPad, not as responsive and loses in the graphics department. The sole thing it has going for it is the ability to run Windows software, and even then, it is limited by the slower processor and 2GB of RAM. For those who need Windows software, the Surface Pro 3 is a better choice. While it starts out at $799, which translates to $930 with the Type Cover, the tablet will ultimately last you longer. Right out of the gate, the Surface 3 is a little sluggish, which will only grow worse over the next few years. For those that aren't burdened by a restriction of using the Windows operating system, the iPad Air 2 is the clear winner. Students can still gain access to Microsoft Office as well as Apple's iWork suite of productivity apps, and as one of the fastest tablets on the market, there's no need to worry about it becoming obsolete in a couple of years. The only real market for the Surface 3 ​is those who absolutely must run Windows and can't spend the money on the more expensive and better Surface Pro 3. In terms of raw power, a Windows-based laptop at the same price tag will run circles around the Surface 3.